Do you find the number display too bright? That repair on the SMD pad looks pretty interesting, maybe it required digging into the PCB to find enough of a working trace to solder to? I agree you should probably test that sooner rather than later. The LCD is not jarring, but if you want to dim it it would be very easy to stick on a semi-transparent black film on top of the display I would think. The repair guy said exactly the same thing, he had to scrape off the PCB until he got to the trace and he then (apparently) soldered an extension to it, to which he soldered the cap? Got tired of constant CPU cooler howling in my P133 rig on every power-on. Thanks god they still make smaller fans. I had to wait for almost a week, since the local store doesn't keep it in stock. Supposed to be high-end, Noctua level. It even has 2-pin connector. If it's anything I expect it to be, I'll get a few more to upgrade other machines. Yeah.. Even though the size of the fan matches socket 7 heatsink perfectly, somehow I ignored the fact that in most cases the fan should be 5mm smaller to fit inside the heatsink. I'll try longer screws or some improvised bracket mounts. I don't believe I've seen 45mm around and 40mm just doesn't give me the right vibes. Update 2: "Longer screws". Back in business! I started by reading through the extra material, which is quite a lot in this game! The game is a treasure hunt of some sorts: your eccentric, rich aunt has died and she and her late husband (a Hollywood producer) have hidden ten 'treasures' in the house. You have to find them in the course of one night to claim your inheritance. Looking forward to actually playing it! Infocom was my early introduction to imaginative video games. Not the first games I played, but the first best. People cared about box contents then, too. Will create a new thread when it's fully complete, but for the time being, here's a pic of the cable management on my favourite PIII build. I found a couple of SCSI 50 to SCSI 68 adapters and a nice cable to make the CD burner cable that much neater! 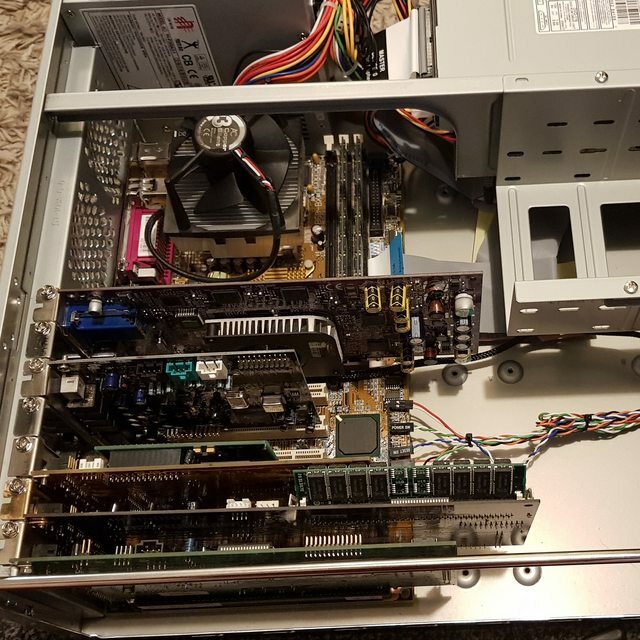 I've been trying different combinations of parts and OSes in my machines, and decided the best way to go with my ibm pc340 p100 was to go fully win95c. After trying a few sound things I found an old SB Vibra16c. Plugged in, it works like a charm. At least it did in the second slot I tried. Installed the original NASCAR racing, and it works! This should work well as a late Dos machine/early win95 box. I had a SB audiopci card in it, which somehow I had working, but after my CD-ROM crapped out, it threw all the PNP settings in disarray and I couldn't replicate it. Weird when downgrade is an upgrade. I have a p200mmx Sony vaio with a built in rage ii. Would the audiopci card be an upgrade over the onboard sound? I have win98se on it, if that matters. It depends on the on-board sound. Pretty much every system I have (Pentium III-FX-6300) has the integrated sound, but two of them are disabled since I have the Sound Blaster Live! 5.1 PCI cards installed (Pentium III, and Athlon XP). My old Packard Bell has the ESS AudioDrive ES1688F sound card installed in place of the Sound Blaster 16 CT2740 and it's amazing that I can change the Sound Blaster version from the standard Sound Blaster to the Sound Blaster Pro using the jumpers. My main desktop has the integrated audio, but I use the HDMI (has built-in audio) port to hook it up to my TV set for smoke testing old IDE hard drives or to a computer monitor, but sadly, no room for a Sound Blaster X-Fi PCI-E sound card (should've gotten a better board) since the GPU's heatsink fan covers the PCI-E slot. RichB93 wrote: Will create a new thread when it's fully complete, but for the time being, here's a pic of the cable management on my favourite PIII build. I found a couple of SCSI 50 to SCSI 68 adapters and a nice cable to make the CD burner cable that much neater! Good job, so many people don't bother because older machines (usually) don't produce that much heat that airflow matters. My plan is to do that for my extremely high end Windows 98SE machine (gonna put the PCChips motherboard back in again due to resource conflicts). Funnily enough I salvaged some IDE80 cables from an ancient HP server that are cut and braided just like that! Much nicer than the fat flat cables. The thing that surprises me is that no one (me included) routed the cables behind the motherboard or indeed the motherboard plate. Started doing it a few (10 or so...) years back on my modern builds, now also doing it retro. Works like a charm. Agreed that airflow doesn't really matter so much in a 486-system, but it's more than worth it for ease of access to slots, components and jumpers. dionb wrote: The thing that surprises me is that no one (me included) routed the cables behind the motherboard or indeed the motherboard plate. Started doing it a few (10 or so...) years back on my modern builds, now also doing it retro. Works like a charm. Agreed that airflow doesn't really matter so much in a 486-system, but it's more than worth it for ease of access to slots, components and jumpers. I do that whenever a) there's room in the case and b) the cables are long enough. Ironically SCSI cables are usually really long but the cases usually don't have room. Dell used to have pretty good cable management, maybe still do. Even ribbon cables slotted away flat. Installing W2k RC2 on my AlphaPC 164. Finally sorted the SCSI issues. First attempt was almost successful but the system partition was too small (I gave it a scant 1GB) so after install disk C: was full and it started throwing weird errors. Wiped that off, gave it a larger system partition now (3.8GB), install in progress. Soldered together an adapter, (almost) according to the schematic on page 45 here, to be able to use a Sega Megadrive/Genesis gamepad with my C64. Didn't have the suggested germanium diodes in stock, so decided to take the chance that the C64 wouldn't mind the higher forwarding voltage of regular 1N4148 silicon diodes. Seems to work just fine. Also did a mod to the mod, added a diode mapping the C button to UP, very useful in games that uses UP for jumping, e.g. Giana Sisters. The almighty washing machine lives again! I managed to sort out the capacitorotomy that was done to it by someone else (bought new one and replaced the broken) and the disk roared back to life once again. Installed a Arctic Silent 3 HSF in my Tualatin machine today. I was after one of these coolers for a while due to the slanted base. 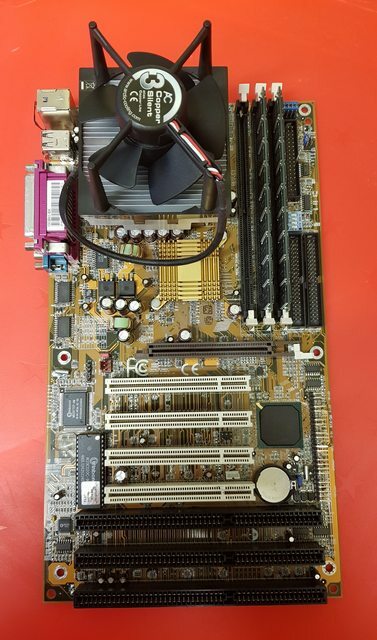 There are caps in close vicinity to the socket which made it impossible to install larger heatsinks. kaputnik wrote: Soldered together an adapter, (almost) according to the schematic on page 45 here, to be able to use a Sega Megadrive/Genesis gamepad with my C64. Didn't have the suggested germanium diodes in stock, so decided to take the chance that the C64 wouldn't mind the higher forwarding voltage of regular 1N4148 silicon diodes. Seems to work just fine. Cool! I use a Master System controller with my C64 and am happy with that - no mod required. That up button trick sounds handy though I must admit. Bancho wrote: Installed a Arctic Silent 3 HSF in my Tualatin machine today. I was after one of these coolers for a while due to the slanted base. There are caps in close vicinity to the socket which made it impossible to install larger heatsinks. What Tualatin board has THREE ISA slots?!? My question would be - is that an Intel board or another chipset maker's board (VIA, etc. ), and, by extension, what chipset is on that board? Yeah, I have a VIA Apollo Pro board with 3xISA that should support Tualatin chips, it's a Slot 1 board though.